For each report type you can choose, which data you want to include in the report. In addition to real-time filtering in reports, InLoox offers dynamic filtering of the most important project data. For global reports you can select, which projects you want to include in the report (= Project Filter). Whereas in project-related reports you have already chosen a specific project by opening it. 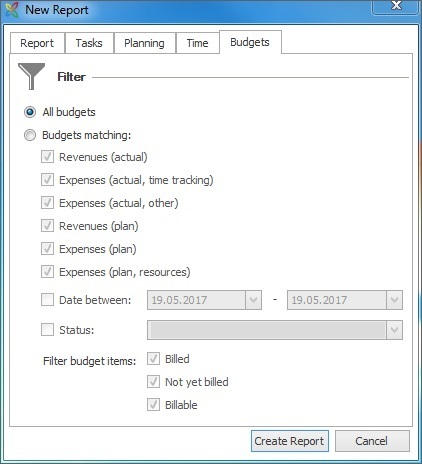 Project-related report: To use one of the following filters, open a project, click on the Reports tab, and then on Create Report. Global report: Open the project overview, then open the Start tab. There click on Reports and Create Report. 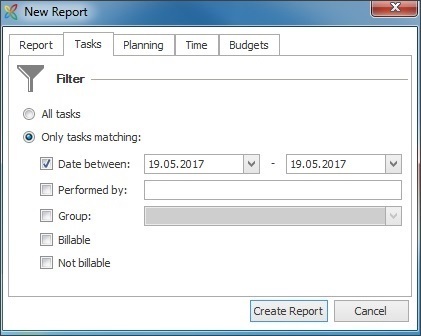 After both procedures a new window (the report dialog) will open. There you can adjust the filter settings. 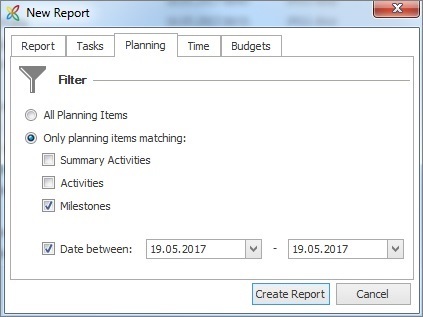 In the report dialog open the Tasks tab. Furthermore, you can combine those task filters. If you want to create a report regarding you project planning, you either include all planning elements (summary activities, activities, milestones) or just selected elements. Additionally you can limit the data by setting a date. 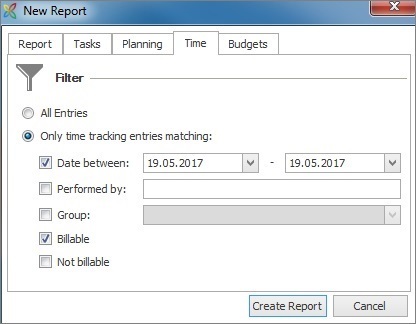 If you are including time tracking entries to your report, you can decide whether to use all entries or you can filter them. You can select time tracking entries of a specific period of time. You can limit time tracking entries to those of a specific person. You can choose entries of a specific group. You can choose between billable and not billable time tracking entries. Furthermore, you can combine those time filters. You can select a period of time. How to filter report data | InLoox 9 for Outlook • Copyright 1999-2019 © InLoox, Inc. All rights reserved.